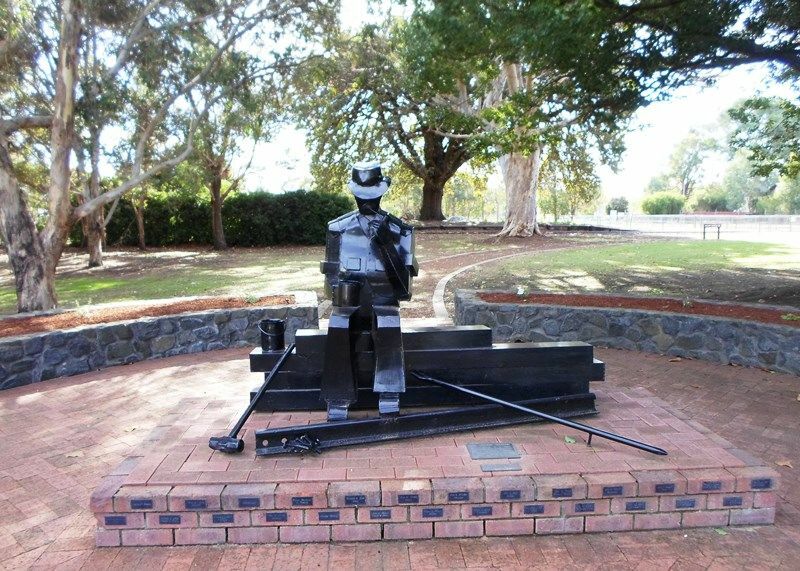 A sculpture "The Railway Fettler" commemorates the role of the railway ganger in the history of the town. The foundation on which the sculpture sits was donated by the local people. Those who donated are named on the bricks. Boyanup is an Noongar Aboriginal name, said to mean "a place of quartz" as "Boya" means "rock" or "stone". The name was first recorded by an explorer in 1852, and a road survey in 1869 shows the town name as "Boyinup". 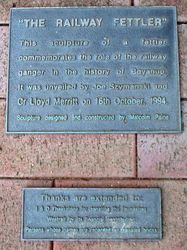 In 1888 a railway was built between Boyanup and Bunbury, and the townsite was gazetted in 1894. This sculpture of a fettler commemorates the role of the railway ganger in the history of Boyanup. It was unveiled by Joe Szymansku and Cr Lloyd Merritt on 16th October, 1994.